BWA is represented on the Stakeholders Reference Group for the development of a Statewide Bushwalking (and Trail Running) Strategy. BWA has since March 2018 participated in several meetings and forums as part of the process. With input from members, we also provided an early Discussion Paper to the strategy group. The strategy consultant appointed by DLGSC-Sport and Recreation and DBCA-Parks & Wildlife Service is preparing a draft of the strategy for consideration by the project management group and the stakeholders in first quarter 2019.
opportunities in the forests of the northern Darling Range for the 80% of WA’s population living in the Perth metropolitan area. 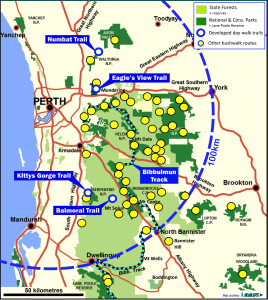 Bushwalks and bushwalking areas in the Darling Range near Perth (click for larger map). Recognition of survey results that a majority (70%) of recreational bushwalkers prefer walks reasonably close to home. 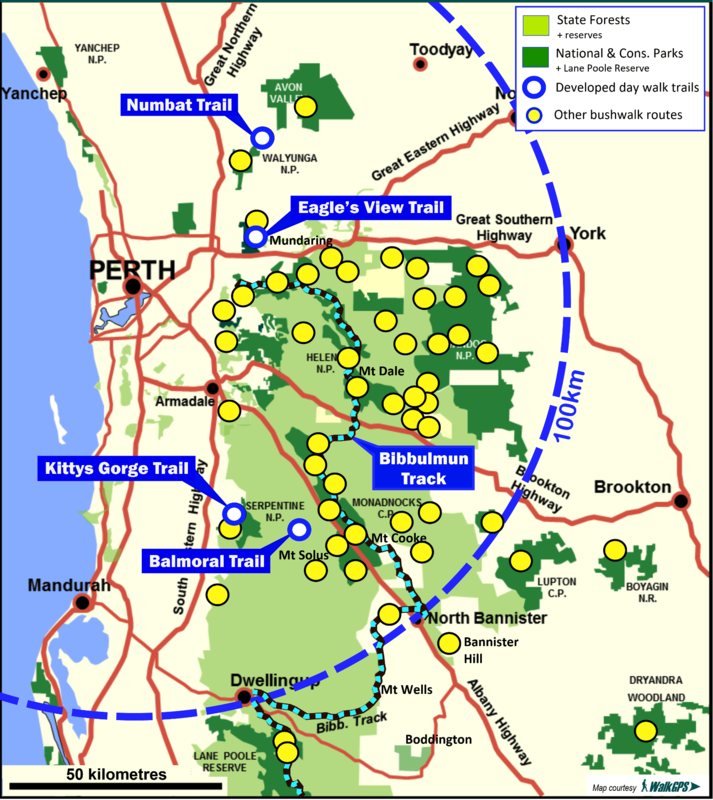 Eagle’s View Walk Trail in John Forrest NP is the only developed circuit walk of at least 15km length within the Perth metropolitan area. 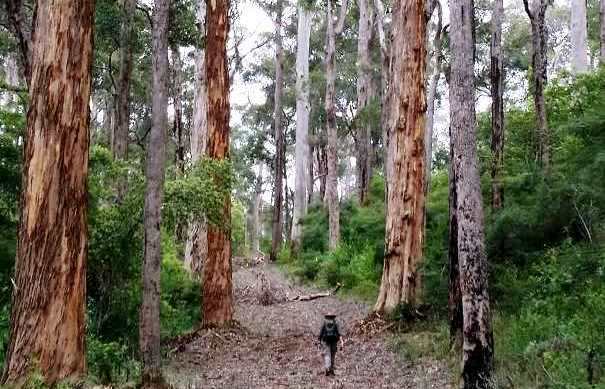 With the exception of the Bibbulmun Track through-walk, most of the existing designated walk trails in the parks and state forests of the Darling Range near Perth are short walks at the least challenging end of the spectrum. Not all bushwalking trails require intensive development and high maintenance to remain sustainable. Intrusive ‘over-development’ of the more primitive trails may destroy the very essence of the experience they previously offered to walkers. Experienced local and visiting walkers, tend to seek out longer walks, risk and adventure as a life experience while others also seek solitude and a wilderness experience. – especially in light of the huge predicted “health and social costs over the next 10 years if people don’t get moving” (ref. Sport Australia, Aug. 2018). West Australians need opportunities and environments that encourage them to walk more. Submission on DLGSCI-Sport & Recreation ‘Common Ground’ (strategic funding review) Discussion Paper, Nov. 2018. 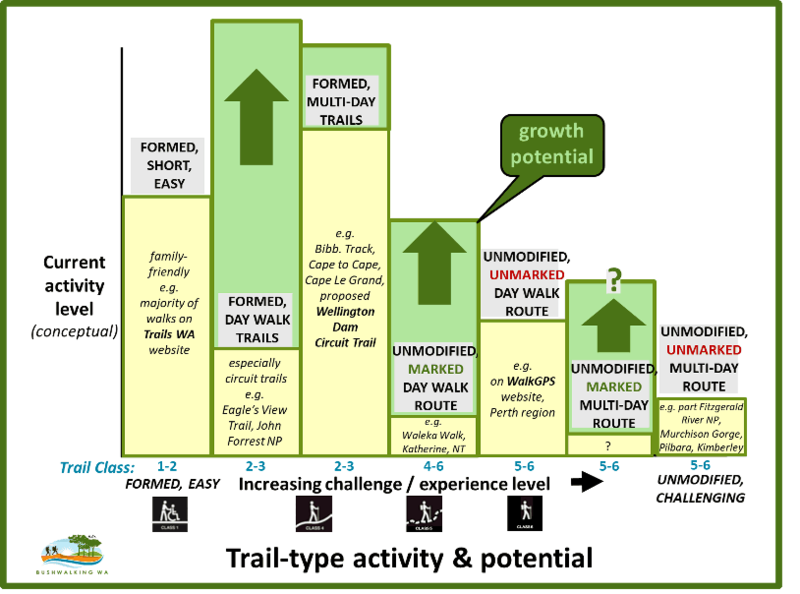 Trails Strategy Discussion Paper re WA Bushwalking (& Trail Running) Trails Strategy development, April 2018. Comments on Draft Collie River Valley Trails Strategy 2018-2021, June 2018. Western Australian Trails Strategy Development submission, 2008.